Do you like to Jam? Are you ready to party? Join award-winning family musician Charity Kahn for a highly interactive, joyful, playful and unique music class that will inspire your children (and you!) to sing, dance, stretch, breathe and imagine. The JAMboodas Family Dance Party takes place one each month and is appropriate for all ages. These dance parties provide a fun and social way to check out the JAMboodas vibe. We are incredibly lucky to get to share Charity's music with the Recess Community each month. Charity has written all of the songs she performs and has an incredible library of music to share with families. Her tunes range from upbeat, rocking out, dancing, singing at the top of your lungs songs to winding down, chilling out, tucking in, singing in sweet harmonies. For reviews and more info and to listen, go here. Whatever you do, come enjoy a morning of song, dance and mindfulness with your wee one, gramma and grampa, friends and neighbors...anyone you love! Mega Bloom is a lover of folk music and an early childhood educator. Her debut album combines these two interests into a fun, musical experience for children, teachers and families. Join us to celebrate the release of this new CD! Drum Workshop with Craig Miller. This workshop is an introduction to rhythm and the percussive instruments of the world. Children will be prompted to participate in body percussion and playing drums. In the first few years of life, more than 1 million new neural connections are formed every second. Our goal at Recess is to provide a space rich with opportunities for exploration to support that rapid brain development. In addition to our two playspaces, we have a full schedule of activities you are invited to take part in. Our Playspace Activities are designed for kids to engage directly if they like, or benefit from being within an earshot even if they're not interested in sitting and participating directly. When music activities are happening in the playspace, for example, we often see two types of kids. There is the child excitedly sitting at the edge of the parachute, shaker in hand who is eager to follow along. 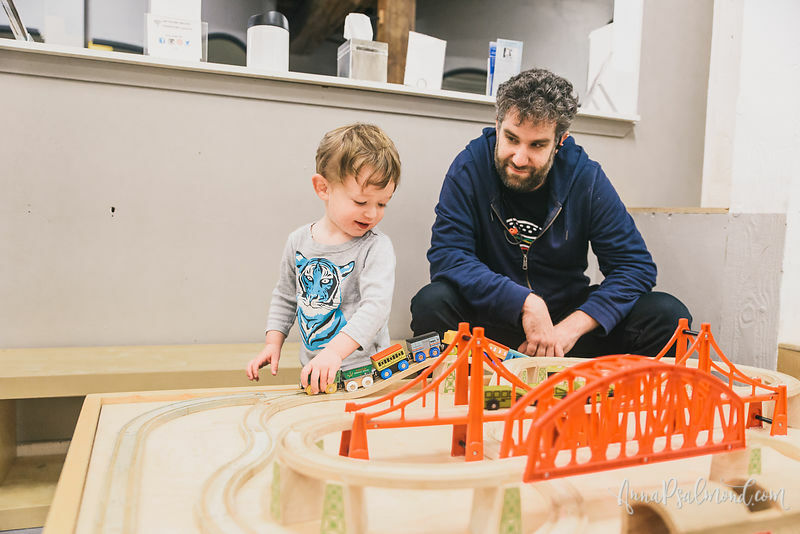 There is also the child over at the train table, interested in music, but not interested in being a direct participant (at least, not in that particular moment). Both children benefit from hearing the music, learning about rhythm, exposure to language and sequencing. Throughout the week, our activities range from music to sensory lab to storytime. All of these are totally flexible -- they are included in your visit, do not require sign up and if you dip in for a few minutes and then your child is ready to flit to another activity, that's absolutely fine! Check out the schedule here. Play is an opportunity for children to learn who they are, what they can do, and how to relate to the world around them. Support your child's development and your journey as a parent. To join in on the fun, reserve a Playspace Pass or sign up for membership. This Spring, Mega is coming to Recess to share her musical talents (nestled into a background of Early Childhood Ed) with our community. Come play on Friday Mornings at 10am to meet her and enjoy this beautiful, interactive activity. We all benefit from music in our lives. If we are exposed to music and given the opportunity to explore than no note will be out of reach. Just as a child needs to be exposed to books for literacy, children need to be exposed to live music to play it, enjoy it and try it. Music education is similar to other early childhood classroom curriculum, it must be joyful and playful. Children play to make sense of their environment, the world they are socialized into and through play children begin to understand how they influence it. Children need to be able to move their bodies -- and the Recess playspace is a great place to do so. It is important to allow children to feel the rhythm of each song or chant and feel the beats in their bodies. All of the activities she leads include fine and gross motor activities that are both suggested and guided. Musical classes assist in the development of all of the developmental domains as well as overall health and wellness. Music is calming, relaxing and soothing to any soul no matter the age. During music class children utilize cognitive and language skills whenever they listen to song lyrics and repeat them back. If given a shaker and asked to repeat back a rhythm children must listen and count the beats to copy the rhythm. When in class with others, children have an opportunity to practice using social/ emotional skills to wait for their turn to dance in the middle of the circle, or to add a silly word to a song or to bring a movement idea to the group, as well as when the classroom group sings together to create a beautiful melody. Children use physical skills to do gross motor activities like hopping, jumping, stomping, twisting, etc as well as using fine motor muscles to hold a shaker, to hold hands, or to copy small body movements. Children will be active participants! Mega Bloom began working with young children as a Naturalist ten years ago. Over the past decade, Mega has held many positions in various teaching environments from outside the classroom, teaching in gardens and the forest teaching environmental science to most recently teaching in early childhood education classrooms. Mega has taught toddlers and preschool aged children for the past three years in Oakland, California. When interacting with young children, Mega takes notice of each child's individuality and emphasizes their creative strengths. Mega loves to facilitate music and movement activities with young children! Hope to see you and your children for the first class March 16th!